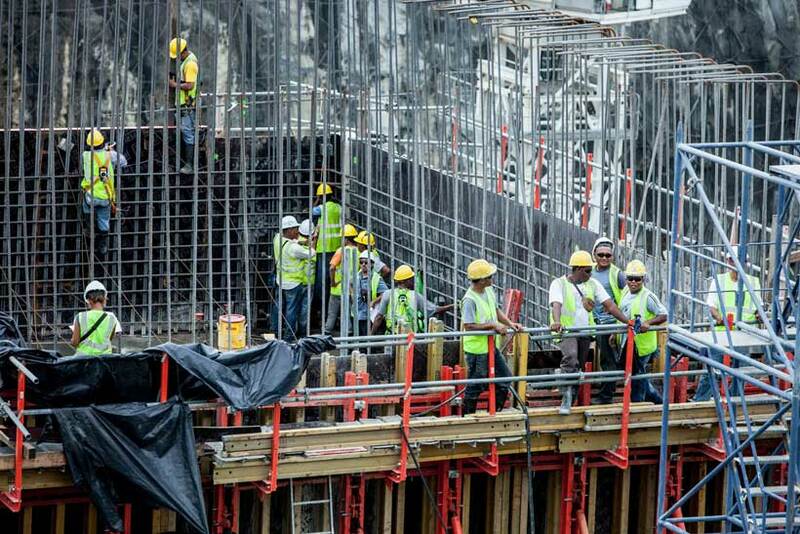 Mobilizing private investment in infrastructure will be key to increase growth and resilience in developing countries. Well-planned infrastructure can raise potential output growth and help reduce the carbon footprint of progress. Directing excess savings from advanced economies towards emerging market and developing economies (EMDEs) helps address the low investment returns of institutional investors in developed economies while supporting achieving the Sustainable Development Goals (SDGs) by 2030. Infrastructure is a natural match for insurers’ long-term liabilities. Long-term fixed income instruments fit well with the long-dated liabilities of insurance companies, especially for those offering life insurance and annuity products. Infrastructure projects tend to yield long-term, predictable cash flows, with low correlation to other assets and relatively high recovery value in case of repayment arrears. This match is so significant that some regulators provide special treatment for insurers that hold them to maturity. The recent update of Europe’s Solvency II Directive, for instance, provides for a “matching adjustment” that allows insurers to discount their liabilities by the rate of return of infrastructure-linked instruments, which tends to be higher than the market-implied discount rates, thus reducing the present value of these liabilities and the business cost for insurers. However, insurance companies still allocate less than 2.5 percent of assets under management to infrastructure investment, in part because of insufficient understanding of the risk profile of this asset class. There are many reasons for the low participation of infrastructure, including the limited supply of fully operational infrastructure projects issuing debt. There is also an informational hurdle, with investors’ perception of infrastructure being risky, despite the long tradition of regulated utilities of yielding low-risk cash flows. This perception is also reflected in some regulatory frameworks, which require insurers to allocate sizeable amounts of capital to support investments in long-term debt, especially for unrated transactions, thus reducing the internal rate of return and the profitability of holding these instruments. More recently, European regulators have acknowledged the particular risk properties of infrastructure, reducing the capital charge on this type of finance. Following the advice of the European Insurance and Occupational Pension Authority (EIOPA), which performed a comprehensive analysis of historical data of infrastructure risks in advanced economies, the European Commission in September 2016 revised down the standard formula for capital charges on qualifying infrastructure debt (and equity) investments under the Solvency II Directive. This calibration resulted in a significant relief of infrastructure debt relative to equivalent corporate bonds and loans. However, this more favorable regulatory treatment remains restricted to investments in countries that are members of either the European Economic Area (EEA) or the Organization for Economic Co-operation and Development (OECD). So, infrastructure projects in many EMDEs do not benefit from it. New empirical analysis of infrastructure debt in EMDEs offers an opportunity to widen the perimeter of a more favorable regulatory treatment. Recently, Moody’s Investor Service published a detailed analysis of the historical credit performance of project finance bank loans, which account for 80 percent of the funding of project finance transactions originated globally since January 1, 1983. The study reviewed data of more than 6,000 projects from a consortium of leading sector lenders (Moody’s Project Loan Data Consortium), of which more than 1,000 are projects in EMDEs. The study shows that credit performance of project loans in EMDE debt is not substantially different from that of comparable debt in advanced economies. As in advanced economies, the risk profile of project bank loans in EMDEs improves over time. 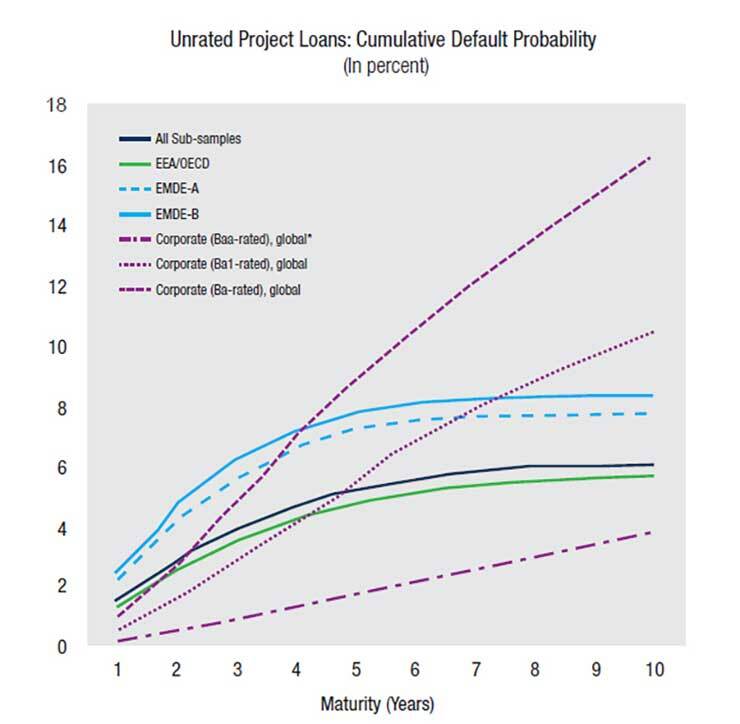 Specifically, the marginal default rate–i.e., the likelihood that an infrastructure loan performing at the start of a specific year will default within that year–exceeds the level for non-investment grade corporate exposures by the time of the financial closing of the project, but it steadily declines as the loans mature, when projects reach “brownfield stage”. Cumulative default rates of infrastructure become flat like those of investment grade instruments, while rates for originally equivalent corporate debt continue to rise throughout their lives (Figure 1). After five years, the marginal default rate of project loans is consistent with that of “AA/Aa”-rated corporates and, actually, on average lower in EMDEs than in advanced economies. For PPPs, the cumulative rate of return over the first 10 years of project loans in EMDEs is virtually the same as those in advanced economies, at less than 6 percent. Also, recovery rates for EMDE project loans average about 80 percent, and, thus, are like those for senior secured corporate bank loans. Sources: Moody’s Investors Service (2017) and Jobst (forthcoming). Note: based on the shortened study period between 1995 and 2015; the sub-samples “EEA or OECD,” “EMDE-A” and “EMDE-B” correspond to the samples selected in the Moody’s report and cover EEA and OECD member countries, all non-high income countries, and all non-high income countries without EEA or OECD members (i.e., Bulgaria, Croatia, Mexico, Romania, and Turkey). Applying the relevant data from the recent Moody’s report to two important solvency regimes for insurers shows sufficient scope for reducing the capital charge for investments in infrastructure debt. World Bank staff in the finance area have recovered the credit risk parameters from the published data on project loans and applied them to the relevant elements of the Solvency II Directive and the International Capital Standard (ICS) for internationally active insurers, which will be implemented by the International Association of Insurance Supervisors (IAIS). We apply these data to these solvency regimes, differentiating the properties of infrastructure loans from the standard corporate exposures without adjustments to current regulatory methodologies. Only the intrinsic risk profile of infrastructure debt vis-à-vis the standard risk assumptions on long-term debt was considered. When doing so, we find that the capital charges would decline significantly when these differences in risk are considered. 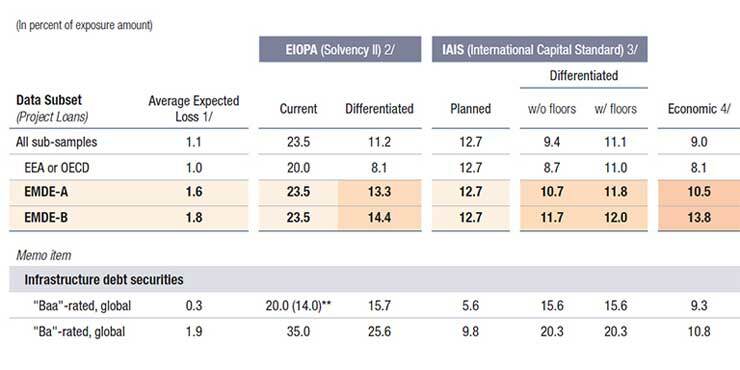 Specifically, for a 10-year risk horizon, the annual expected loss of project finance loans (1.6 percent) is half of the expected losses implied by “Ba/BB”-rated non-financial corporates, and the implied capital charges would decline from 23.5 to 13.3 percent under Solvency II (Table 1). Under ICS, it would drop from 12.7 to 10.7 percent, consistent with the estimated economic capital within the range of 10.5 to 13.8 percent (based on the 99.5 percent conditional tail expectation). Additional analysis of rated EMDE infrastructure debt securities, using data from another Moody’s Investors Service report published earlier in 2017, indicates some flexibility to lower capital charges on these instruments under Solvency II. For instance, the charge for “Baa/BBB”-rated securities, would come down from 20 percent to about 16 percent. Sources: BCBS (2017), European Commission (2015 and 2017), IAIS (2017), Moody’s Investors Service (2017) and Jobst (forthcoming). Note: recovery rate refers to ultimate recovery rate; */calculated over 10-year horizon with recovery rate consistent with unsecured senior claims; **/ reduced capital charge if qualifying infrastructure exposure in EEA or OECD country; 1/ fixed risk factors of the Solvency II SCR Standard Formula — Spread Risk Sub-Module for fixed income investment, as amended by Regulation (EU) 2015/35 (October 10, 2014) and EU Regulation 2017/1542 (June 8, 2017); 2/ credit risk factor under the proposed International Capital Standard (ICS) is assumed to follow the advanced internal ratings-based (A-IRB) approach for specialized lending (project finance) using the cumulative PD with/without a floor for PD and LGD and full application of the maturity adjustment; 3/ based on credit risk (PD and LGD) of global non-financial corporate debt issuers; 4/ based on 99.5% conditional tail expectation (CTE). Even a modest reduction in capital requirements for long-term infrastructure investments can significantly boost return-on-equity (RoE) under a prudent but differentiated regulatory treatment. For instance, considering a stylizing illustration for a European regulated insurer holding a 10-year infrastructure loan yielding 4.6 percent annually (less the insurer’s borrowing cost of 1.0 percent and an income tax rate of 35 percent), reducing the capital charge of 23.5 percent (under the current standard formula approach applied to corporate exposures) to about 14 percent (under a differentiated approach) would raise the RoE of investing in such an instrument from 10 percent to more than 17 percent. The latter figure is more than 50 percent above the average RoE of European life insurers in 2016. Sources: Bloomberg L.P., Moody’s Investors Service (2017) and Jobst (forthcoming). Note: The calculation is based on the annual yield (less the risk-free rate of 1.0 percent) after tax (35 percent); 10-year U.S. government debt yield at 2.31 percent as of end-Sept. 2017 and median RoE of European life insurers as of mid-2016 (EIOPA, 2017); 1/ average infrastructure loan rate in the U.K. (4.3 percent) according to Institute and Faculty of Actuaries (2015) at end-2014 and scaled to EMDE consistent with infrastructure bonds (4.6 percent); 2/ based on the Solvency II Spread Risk Sub-Module (European Commission, 2015, 2016 and 2017), assuming unrated exposure is treated like corporate exposure (loans/bonds) with credit quality step (CQS) of 5 (‘B’) and assumed maturity of 10 years (OECD, 2015). Lower capital charges can help maximize finance for development, unlocking an important source of long-term capital for global growth. Although regulatory disincentives for infrastructure investment in EMDEs may be just one of the impediments to growing exposure to this asset class, the evolution of these regulations can be an important step forward. By helping to increase the rate of return of holding infrastructure-linked instruments potentially by up to 50 percent, it may help insurers and other institutional investors to accelerate the rebalancing of their assets in ways that will help crowd-in resources in quality climate-smart infrastructure projects in EMDEs. These projects are an important part of strategies to increase the resilience of these economies while helping eliminate extreme poverty and produce shared prosperity. 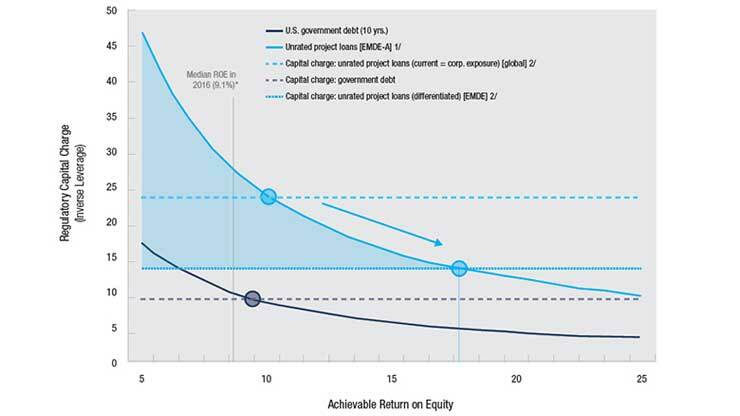 Note: The capital charges computed here were reached by using the implied transition probabilities for infrastructure loans and (i) mapping the current reduction factors for qualifying (unrated) infrastructure investment for EEA/OECD countries under the Solvency II SCR Standard Formula — Spread Risk Sub-Module to the expected loss of project loans in EMDEs and (ii) calibrating expected loss to the credit risk stress factor for ICS (IAIS, 2017) following the advanced internal ratings-based approach according to the finalized Basel III framework. For details, refer to Jobst, Andreas A., forthcoming, “Credit Risk Dynamics of Infrastructure Investment—Considerations for Insurance Regulation,” Working Paper (Washington, D.C.: World Bank Group).